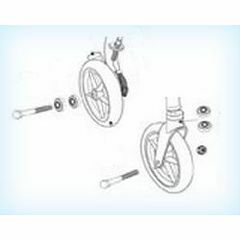 AllegroMedical.com presents The Drive Front/Rear Wheel Assembly for Drive 726 Rollator. This wheel is a replacement for the front or rear wheels found on the Drive 726BL or 726RD rollators. The 6" wheel includes the bearings needed to attach it to the rollator. The wheel is simple to add with minimal tools needed. I need a 6"wheel assembly, with the shaft with a lock washer and a nut.